More from Ora: What About Obama Has Robert Redford ‘Puzzled'? In an intimate, wide-ranging interview, Morgan Freeman opens up about not seeing many scripts, his relationship with President Obama, and his love of marijuana. Plus, the Oscar winner and self-described "ladies man" details where he got that voice. “When I read the script, it was special. I told my agent I’d play any role. I didn’t know because he didn’t say read for this part. I read the script and that was it. And then I called and said I’ll play any role and he said they want you to play Red. Really?” - Morgan Freeman on Shawshank Redemption. “The first thing is his speed. He just doesn’t fool around. You got it, let’s move on. Number two, he doesn’t fool around with actors. He hires you to do the job so he ain’t doing it for you. He just tells you what we’re trying to get in terms of the shot and you’re on your own…He respects the actor. And everybody who’s ever worked with him come away with that feeling. This guy’s tops.” - Morgan Freeman on working with Clint Eastwood. “Well, I’m not quite sure that there is a diversity issue. The fact that there was no blacks nominated for an academy award, okay fine. There are many years when there aren’t, but you know, there were no asians either. I think if we’re going to talk about diversity in the movies, let’s not talk about the academy awards. That’s an outcome. That’s the end line. We need to go way way back. We need to go back to people who are making the movies, the directors, the producers, people who are behind the camera- I don’t see nobody black behind the camera in here. That kind of thing. 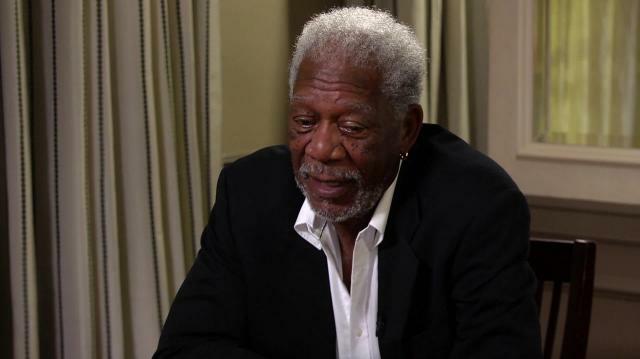 It’s not the academy awards.” - Morgan Freeman on Hollywood’s diversity issue. “Oh, I’m a big fan. Since I’ve read the book, the audacity of hope, he’s had me in his hip pocket. Whatever he needs, if I can provide it, he’s got it. He knows it.” - Morgan Freeman on Obama and their relationship. “There’s been a frightening loss of bee colonies, particularly in this country. I don’t know about around the world, but to such an extent that the scientists are not saying this is dangerous.” - Morgan Freeman on his bee sanctuaries and the alarming rate of bee loss due to pesticides. “I’m not that much of a connoisseur. I don’t know what strains are. If you have some good smoke, try this, yeah…It has to be. They can’t continue to say that it’s a dangerous drug when it’s safer than alcohol.” - Morgan Freeman on his favorite strain of marijuana and the possible legalization of the drug. “I’d like to get a best movie academy award. Best film. My company produces a best film…I don’t have to be in it. Just produce it.” - Morgan Freeman on what’s on his bucket list. “Acting…No, I take it back. Golf.” - Morgan Freeman on what he wishes he was better at.